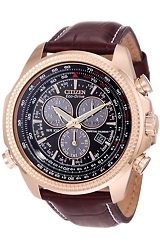 The classically styled Citizen Analog Flight Computer has the great look of pilot's watches from years gone by, a styling many pilots still prefer. 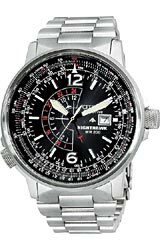 But this new Eco-Drive, battery free, Citizen is state of the art, with every high tech feature from Perpetual Calendar to 24 hour time, to a second time zone (for ZULU Time or destination time) to an analog alarm and an amazing 1/20th split second stopwatch (chronograph). The model BL5403-03X is the classic leather band style worn by pilots for many years. The case is rose goldtone and the dial is black. The watch is large and substantial and it is water resistant to 100 meters or 330 feet below sea level.